Total Basement Finishing is a basement contractor you can count on. Learn why a basement expert is preferred over a general contractor. All TBF dealers are locally owned and operated by highly trained home improvement contractors. Each TBF dealer is given complete access to all of Total Basement Finishing's™ patent-pending products, services and training, making TBF the right basement finishing investment. The TBF basement wall system is unique in the marketplace. It's free-standing, rigid walls offer an insulation factor of R-13, are fire rated class A, and are resistant to mold, water damage, stains and moisture. They also come in a variety of options--isn't that what you really want in a finished basement system? When you schedule your free design consultation, we'll send out a Total Basement Finishing System Designer who will work with you to design the perfect basement remodeling plan to suit your needs and style. The Total Basement Finishing™ dealer network of trained home improvement contractors offers the best system features, service and design. 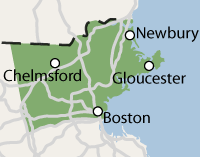 For a Free Estimate in Cambridge, Lowell, Boston, Somerville, Lynn, Framingham, Lawrence, Haverhill, Malden, Waltham and surrounding areas, contact us today!